Alex has worked hard to achieve his goals by remaining on honor roll each year of high school and maintaining a part time job at The Fab Shop as a parts technician. The GTC Diesel Technology Scholarship will assist in the next chapter of his education at Lake Washington Institute of Technology as he pursues the Diesel and Heavy Equipment program. My passion for Diesel Technology comes from my Grandpa being a diesel mechanic and spending time with him learning the trade, as well as my dad driving a truck hauling heavy equipment and taking me along with him any chance we got. Together my dad and I have built a car for him and now we are working on a truck for me. This truck is my dream truck. Not only have my dad and I built it from the ground up together swapping parts and rebuilding the motor but we have spent countless hours in the garage together and I learn something new every day. I am pursuing this career as a Field Diesel Technician because the opportunities in the field are endless. I enjoy being hands on, challenging myself, learning and solving the mechanical issues I will be presented with every day. It is a career where I can continue my education to keep up with the growth of the industry. In five years, I plan to be graduated with my Associates Degree and to have finished up my Bachelor Degree while holding a career in my related field. I enjoy this work, I am passionate about the technology involved in this field, and I have had my plan and have working towards it since I started high school. The GTC Dealer Family is proud of Alex and eager to see him achieve his goals within the Diesel Technology field. 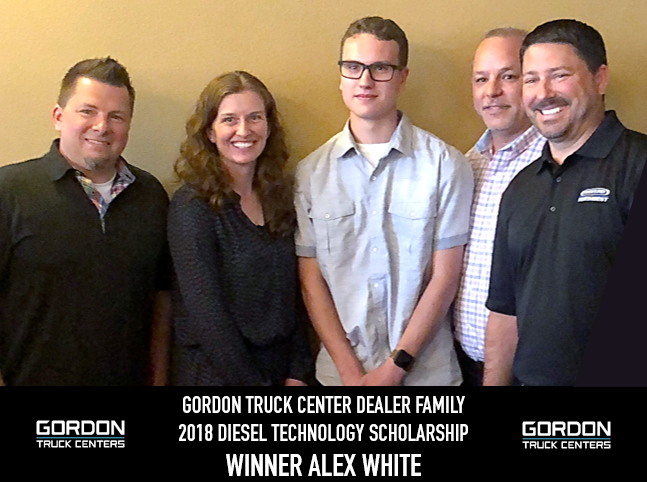 Awarded to Alex is a two-year, renewable diesel technology scholarship of up to $15,000 for graduating high school seniors in the Sumner, WA school district. The scholarship is intended to support the next generation of students choosing a career in diesel technology and is the second scholarship awarded by GTC since 2017 through a partnership with the Sumner Rotary Club.